A new biography documenting the legacy of Can drummer Jaki Liebezeit is currently in the works with those behind it launching a campaign to help fund the book's production. Having passed away in January of this year, Jaki Liebezeit is known not only for his position as a founding member of Can but also for his precise, passionate and utterly awe-inspiring drumming technique. Many often compared his technique to a drum machine—a comment to which he replied “I can play a little bit like a machine but the difference between a machine and me is that I can listen, I can hear and I can react to other musicians, which a machine cannot do." Perhaps the most standout trait of the artist was his E-T theory, a morse code-inspired method of playing and composing rhythms that revolves around sets of long and short marks. Whereas most drum technique is centered around tempo, Liebezeit rejected this idea entirely and instead focused on density. Thus E-T was revolutionary in the drumming world, and has inspired many admirers to model their own drumming style after the Can drummer. 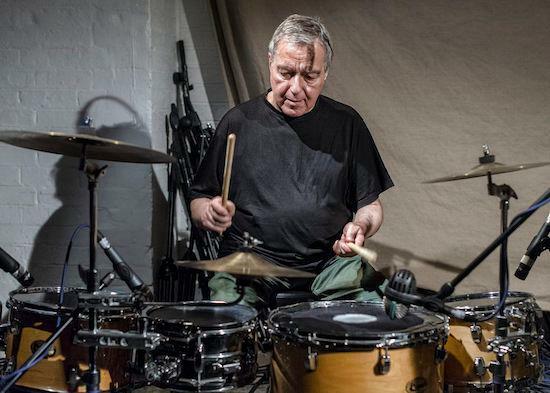 Editor Jono Podmore, John Payne, Drums Off Chaos, Gero Sprafke, Burnt Friedman, and Bryan O’Connell have all come together to produce the biography, entitled Jaki Liebezeit: Life Theory and Practice of a Master Drummer, in memory of the artist. The book includes a full biography, explanation of Jaki’s E-T theory, an overview of Liebezeit’s hand-made equipment, a complete discography and more. Whereas Liebezeit was never able to transcribe his own theory, the group fortunately was able to compile the method before it was lost or corrupted. The book is available for purchase by pledging to an online campaign, which benefits Liebezeit’s estate in order to support further creative projects inspired by the artist. Pledge to the campaign and get your copy of the biography here.